For the third year in a row Walmart has exclusively carried and sold Peeps Mystery Flavors. Past years some of the mystery flavors have included buttered popcorn, chocolate milk, fruit punch, and sour green apple. You can buy these packages at Walmart for $1.12 per package (I looked it up on walmart.com). There are 3 different mystery flavors. I’m kind of curious what the mystery flavors are this year. Do you like Peeps? Does your family like Peeps? If so, grab some for the Easter baskets! 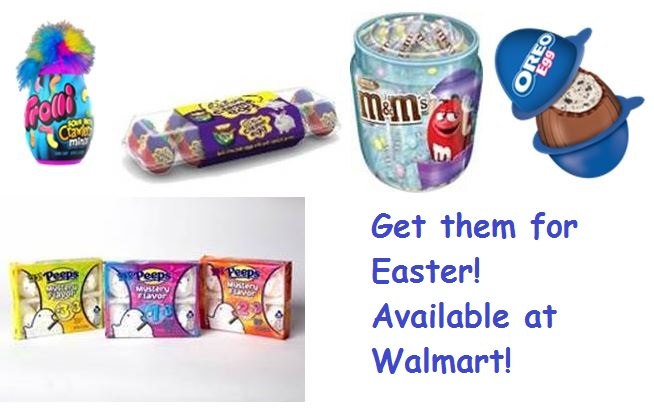 So if you are looking for some candy such as these for basket filler, check out Walmart’s Easter goodies. I was just in there the other day and our local Walmart has a pretty big selection of all kinds of candy. Some of it really cute for a kid’s Easter basket. I don’t tend to buy my kids tons of candy but I do shop around for the best prices on candy and honestly, Walmart seems to have the lower prices. Stay tuned because soon I will be writing up a blog review for some of this candy! Disclaimer: I was not compensated for this post. However, I will be receiving samples for an upcoming blog review. All opinions are 100% my own.